In August 2016, in response to a growing number of casual conversations with teachers expressing dismay at the public perception of their profession, their schools and the value of public education, anthropologist Laura Gorbea designed a research project that sought to better understand the social construction of "failure" and within the same effort document the process by which education value is created within the public education system. With a research plan in hand, Altamente approached several school communities, the Puerto Rico Teachers Association and their over 400 partners that work in public schools (teachers, librarians, social workers, principals and other staff) asking for their interest and support in such a research and communications venture. The response was overwhelming. Parents in town hall meetings, "thanked" us for the initiative. Half of all public school alumni who completed an evalution of their school experience and shared their opnions offered to continue collaborating in other ways with the research project. Coincidentally, a few weeks after the project was first presented to the "client" newspaper headlines on the Island reported on a stateside editorial that advanced the argument that Puerto Rico's economic crisis could be explained because of the dire state of their public education and hence, the underdeveloped human capital.This research questions the very foundation of that analysis as well as the validity of the data sources presented. This research project is still ongoing. The initial ethnographic observation in schools around the Island was completed in November 2016. Altamente plans to hold town hall meetings around the Island to present the preliminary findings to the client/public and incorporate the client/public perspective on the data and analysis gathered, before pursuing national communication venues and sharing this exercise in public anthropology of education in Puerto Rico with new audiences. For more information, please contact: Dr. Laura Gorbea, lgorbea@altamente.com. 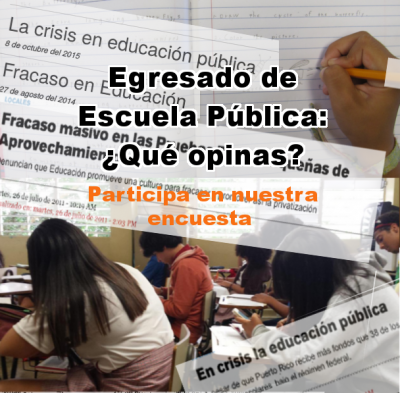 If you are a teacher or ex-alumn of the Puerto Rico public school system, you can still add your voice to the project!